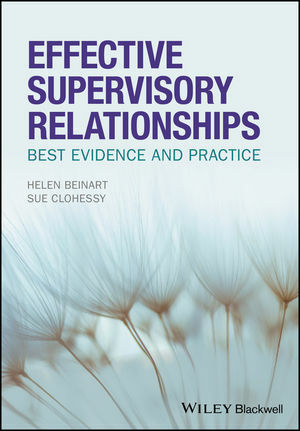 Effective Supervisory Relationships: Best Evidence and Practice is the first book to explore in detail the Supervisory Relationship, which research has consistently found to be the most critical component of any supervisory process. Helen Beinart and Sue Clohessy – two experts in the field – draw on world-wide studies that cover all major therapeutic approaches to the Supervisory Relationship, and include detailed coverage of cultural competence and issues of effective multicultural supervision. The result is a comprehensive resource that offers cutting-edge, internationally relevant information in order to inform study, training, continuing professional development and practice. HELEN BEINART is the former Director (Clinical and Professional) of the Oxford Institute of Clinical Psychology Training, Oxford University, UK. Previously, she was Head of Child and Adolescent Health Clinical Psychology Services in Aylesbury and Kingston. SUE CLOHESSY is Clinical Tutor, Course Director of the PGCert in Supervision of Applied Psychological Practice, and lead for Supervisor Training at the Institute of Clinical Psychology Training, Oxford University, UK.